Loretto Hospital received 3 out of 5 stars in the Overall Hospital Quality Star Rating, a new quality measures by the Centers for Medicare and Medicaid Services (CMS) which was recently released for the first time. CMS rated more than 3,600 hospitals across the country on a one-to five-star scale based on 64 of the 100 measures it uses to report hospital performance on its Hospital Compare website. The consumer-oriented website is designed to help individuals, their family members, and caregivers compare how well hospitals care for patients in an easy to understand way. The new star rating summarizes data from existing quality measures including death and infection rates, readmissions, and patient experience. 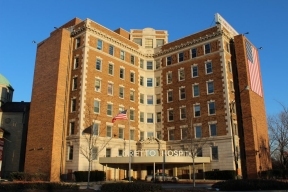 Of the 46 hospitals ranked within a 25-mile radius of Loretto Hospital, Loretto was one of four safety-net hospitals to receive three stars. In all, only 17 hospitals received a rating of three out of five stars, putting them in the 60th percentile and ranking them No. 28 in Illinois. Nine hospitals received a 4-star rating and only one hospital received five stars. Included in the 3-star rating category were Northwestern Memorial and the University of Chicago hospitals, both of which are ranked by U.S. News & World Report as two of the nation’s highest performing hospitals, medical research and teaching facilities. In less than five years, Loretto has realized sustainable growth and improvements throughout the hospital, and created health care programs which have all worked in concert to promote its main priorities– extending excellent patient care and increasing patient satisfaction.